Concept art from Avatar: Discover Pandora, a new museum exhibit. The better part of a decade has passed since audiences last visited the world of James Cameron’s Avatar. Now, with a new set of films coming, the franchise has slowly begun to return to the mainstream. There’s a Cirque du Soleil show touring, a Disney theme park coming soon, and they’ve just announced an interactive museum exhibition. The exhibit is called Avatar: Discover Pandora, and it’ll open in Taipai, Taiwan, on December 7. There it’ll remain for three months before picking up and touring other locations around the world. Those locations have yet to be announced. Basically, the title says it all. 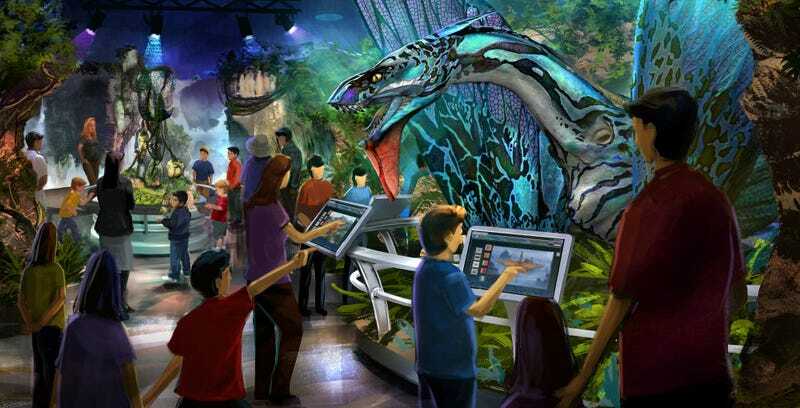 The 12,000-square-foot exhibit pretends Pandora is a real place, and lets people walk around, interact, learn about all the wildlife, and indigenous people, the Na’vi. Then there’s also the human element, where you can learn to pilot an AMP suit and find out how Pandora was discovered. Any little intricate question you have about the world, you can probably find it out here. All of the well-known locations from the film, like the Hallelujah Mountains and Tree of Souls, are represented too, along with all the huge creatures. Basically, this is as close as you can get to visiting Pandora without actually visiting Pandora. If it was real. Or until Disney opens their Pandora: The World of Avatar section of Disney’s Animal Kingdom in Orlando, Flordia, in 2017. For more info on the exhibit, and updates on where it’ll pop up next, visit the official site here.